The Nissan GT-R is advertised as the supercar for anywhere, anytime, and anyone. Released in 2007 in Japan, and in 2008 as a 2009 model for the US, the GT-R is a very fast, car with a relatively low cost to performance. To meet their goals, Nissan had to make some compromises. 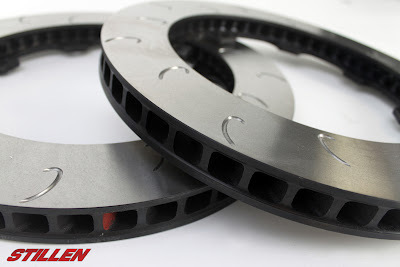 An area of compromise, that doesn't really become evident until you run the car hard,are the materials that Nissan used for the brake rotors. If your disks look like this, its time to stop and replace them. 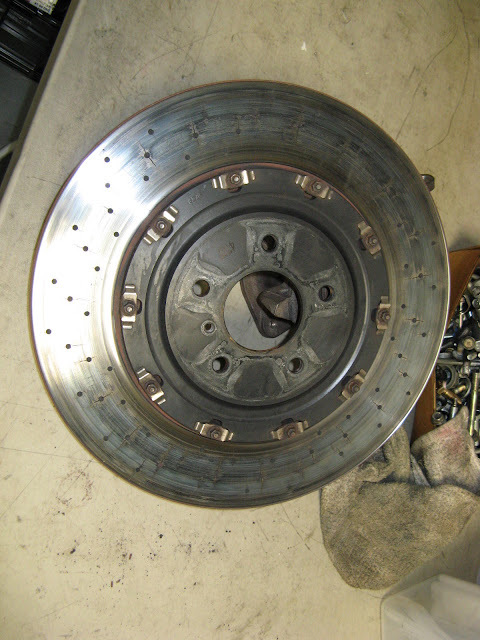 If you daily drive your GT-R, your rotors will probably never look like this. You will wonder what all the hubbub is about, everything is fine for you. However, if you take your car to a track day, and are quick enough, then they will crack. The disks to the left are also heat checked. The small scalely looking surface texture is the heat checking. This is not a problem, and generally only visible up close. This is dangerous, don't drive like this. There is not a magic brake pad that does everything well for everyone. There is an old adage for cars and speed that goes something like fast, cheap, and reliable, pick two. 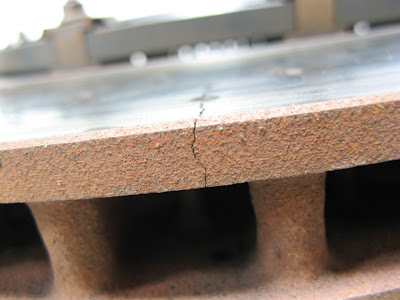 In the case of brake pads its dust, noise, and heat handling. Generally the better they stop, the higher the coefficient of friction, the more dust and noise they throw. The less dust and noise, the lower the coefficient of friction, and the less heat they can handle. 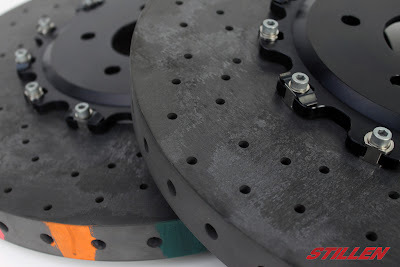 A constant question that we get is: "Whats the best brake pad?". 1) Is this a street car? 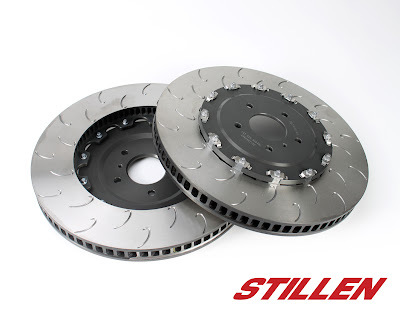 2) What brake pads do you have on the car now? 3) Do you go to the track? 4) If you go to the track how many times a year? 5) Have you experienced brake fade? 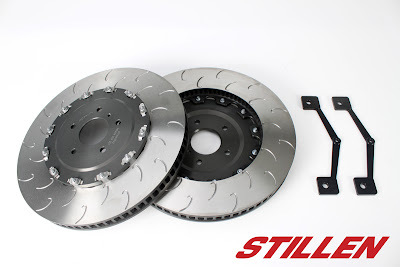 There are a number of companies that make brake pads for the Nissan GT-R. The front brake pad on a GT-R is huge. The FMSI(Friction Material Standards Institute) number for the front brake pad is a 1382. Each company uses their own part number to identify a brake pad, but the FMSI number is universal. Here are a couple of brands and compounds of brake pad available for the Nissan GT-R. 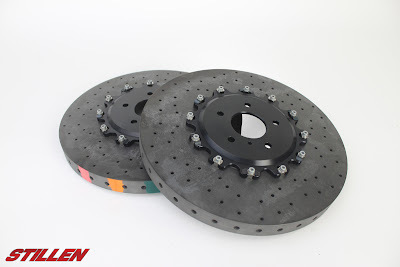 The SpecV Nissan GT-R used carbon ceramic brake rotors from Brembo. 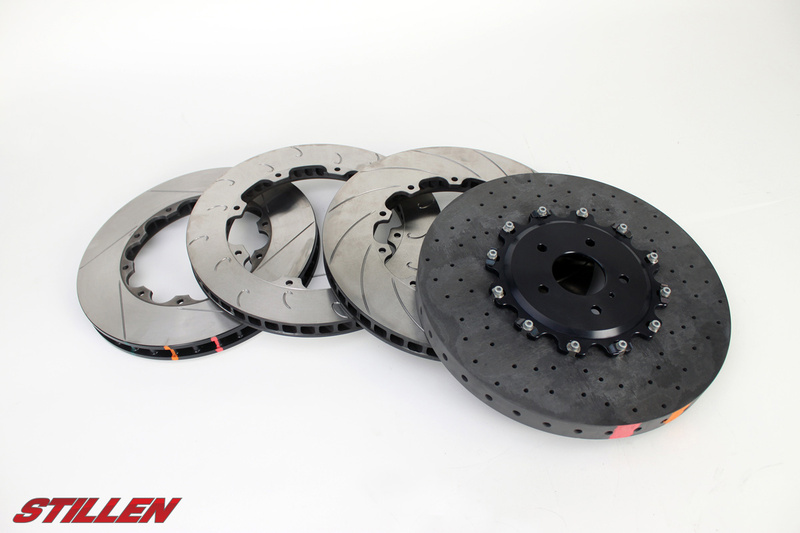 The GT-R brake rotors are similar to the brake rotors on the Corvette ZR1, Porsche, Audi, and other cars that use these brakes from Brembo. They are a carbon ceramic face over a carbon ceramic core. In order to achieve optimum racing brake performance and prolong disc life it is essential that the brakes operate at the correct temperature. 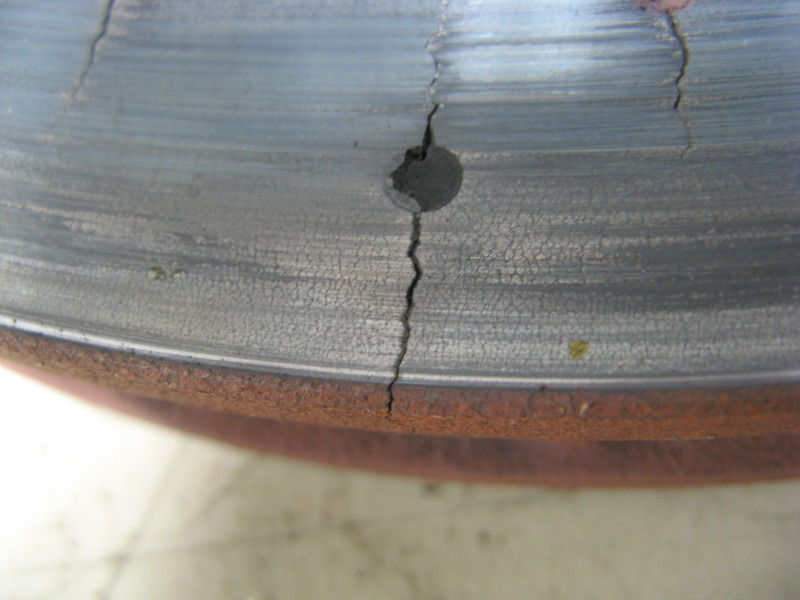 In general discs should run at similar temperatures front and rear and from side to side, dissimilar temperatures will lead to varying brake balance. 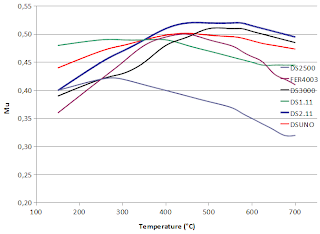 Under racing conditions disc bulk temperatures should normally be maintained in the range 400°C to 600°C for best performance. Disc face peak temperatures may be higher but should not exceed the maximum recommended for the pad material being used. An effective method of checking maximum disc operating temperature is by using temperature paints applied to the disc AP racing paint kit contains three paints, Green (turns white at 430°C), Orange (turns yellow at 560°C) and Red (turns white at 610°C) plus thinners and brushes. 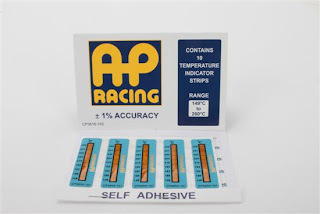 The brake caliper temperature indicator strip is applied directly to the brake caliper to indicate the maximum temperature the caliper has achieved during use.Each packet contains 10 strips with each strip having 9 temperature levels ranging from 149°C to 260°C. Stainless steel braided lines are stiffer than the typical rubber brake lines, but nothing is stiffer than hard steel tubing. That is why it is important to keep the hard lines in place for the firmest, most responsive brake pedal feel. Aircraft-style fitting details are used throughout for leak-free connections – no banjo fittings! The factory junction block functions are replicated to eliminate any possible rubbing issues with suspension travel or steering wheel input. Doing so allows the front lines to be bolted to both the upright and the strut for the most positive location possible. The components are supplied by Goodridge, a recognized leader in racing and high-performance hose and fittings. They supply car and motorcycle manufacturers, top teams in all forms of racing and the finest aftermarket suppliers. Goodridge lines are DOT-compliant (FMVSS 106) and TÜV-certified, the toughest certification in the world. Racing brake fluid is less compressible at all temperatures, so the brakes feel and perform better. To exceed DOT 4 standards, they contain less trapped air and have higher boiling points, making them at home on the street or at the track. AP Racing has been providing the global Motorsports community with the highest quality racing and high-performance brake fluids for decades. These fluids can be found in Formula 1, NASCAR, WRC and other top racing categories worldwide, which is why STILLEN makes the same brake fluids available to you. 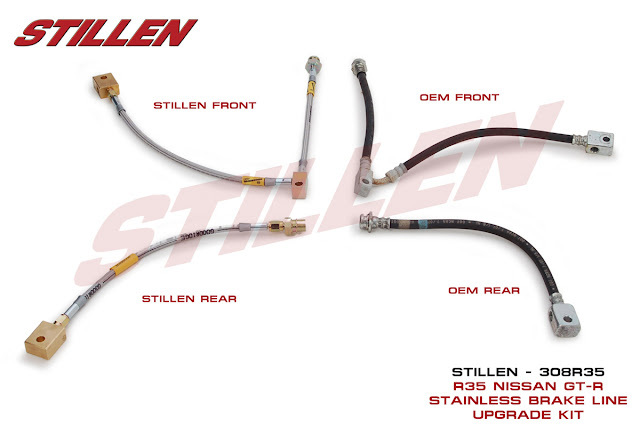 Notes: STILLEN neither sells nor recommends silicone-based brake fluids (DOT5) for use in any automotive brake system. All automotive brake fluids are hygroscopic (absorb moisture over time) and should be completely flushed at least every two years, more often with track use. A complete flush can usually be completed with 3 bottles of new fluid. For the Nissan GT-R, in a pure street car use the AP600, if you track the car, then the PRF 608 is the fluid of choice. 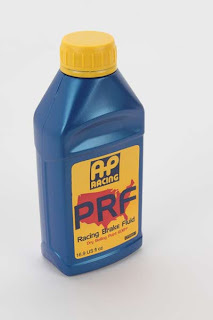 PRF 608 racing formula brake fluid has been developed after years of leading professional motorsports worldwide. 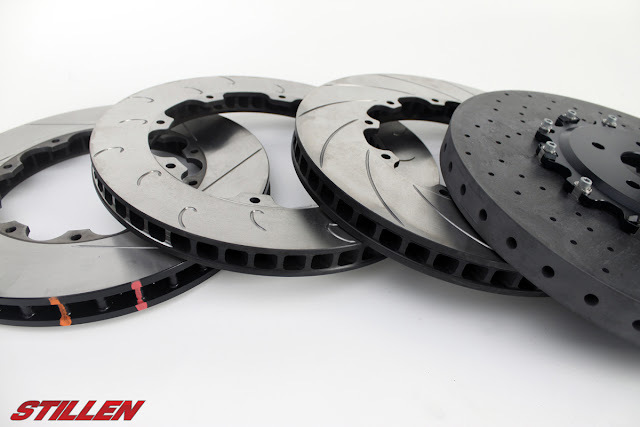 Developed initially for the brutal environment created by carbon-carbon racing brake systems, PRF 608 sees use in Formula 1, NASCAR, LeMans prototypes and other extreme high temperature racing applications. 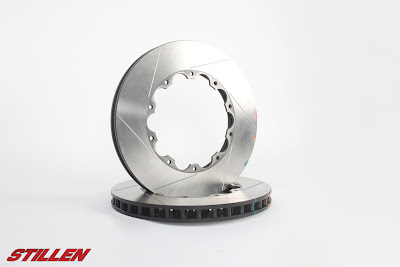 PRF 608 brake has a dry boiling point of 608°F (320°C) and wet boiling point (equilibrium reflux) of 390°F (199°C). More importantly, even when pushed past its boiling point, this fluid is famous for recovering as much as 95% of its compressibility resistance. It’s easy to see why this fluid is one the most preferred by top drivers and pit lane professionals. Note: Not for use in any type of magnesium components, such as certain racing gearboxes and/or clutch slaves. 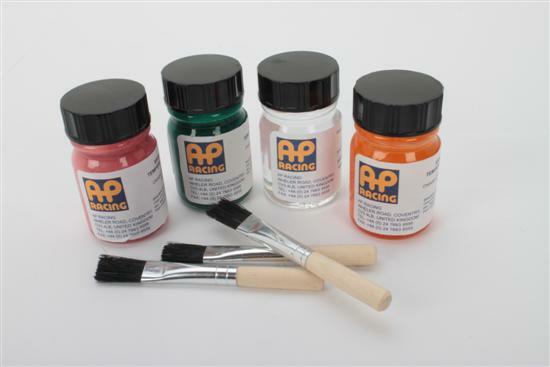 AP600 racing formula brake fluid has been a standard for many years for high temperature racing applications where the ultimate in performance is required. With boiling points of 572°F (300°C) dry and 410°F (210°C) wet (equilibrium reflux), this fluid has most racers and enthusiasts covered. 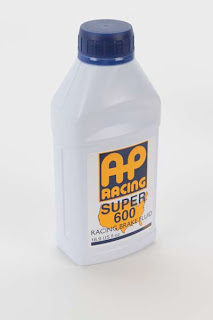 When switching to AP600, any existing brake fluid should be drained completely and purged with new fluid. Note: Not for use in any type of magnesium components, such as certain racing gearboxes and/or clutch slaves.